First Line: "Sherlock Holmes Bookshop and Emporium, Gemma speaking." 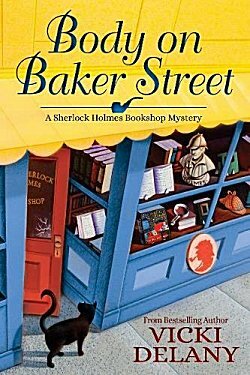 Gemma Doyle jumps at the chance to have bestselling author Renalta Van Markoff come to her Sherlock Holmes Bookshop for a talk and signing, and her friend Jayne Wilson ensures the adjoining Mrs. Hudson's Tea Room will be able to take care of all the excited fans. Things begin to go off the rails when dedicated Sherlockian Donald Morris verbally attacks Van Markoff for disgracing the great detective's legacy. Van Markoff regains the upper hand only to collapse on a table, dead from poisoning. Naturally the police love Donald Morris for the murder, so he pleads with his friend Gemma to clear his name. Once she begins investigating, she finds there is no shortage of suspects. It's merely a matter of finding the real killer. My enjoyment of this series continues with this second book, Body on Baker Street. Gemma still has her Holmesian abrasiveness, eye for detail, and talent for the perfect bon mot, and she had me laughing out loud when she completely lost patience and yet still found a way to force someone to talk to her. I have to admit that Moriarty the cat would be looking for a new home far far away if I were Gemma. You see, Moriarty likes everyone-- everyone except Gemma. He hates Gemma. Naturally no one else can see what the evil little feline is up to. But plotting pussycat aside, one of the reasons why I enjoy this series so much is its bookshop setting. As Gemma talks about stock being sold or ordered, I want to grab my credit card, hop a plane, and go there to run amok amidst all those goodies. A bonus in Body on Baker Street is the author signing, which gives readers an inside look at how booksellers prepare for these events. While I'm talking about added extras, I should also mention illuminating dialogue about contracts and diva authors. The only thing that didn't warm the cockles of my heart was the fact that I found whodunit to be rather easily deduced, but the rest of the book was so good I didn't care. There's still no sign of the elderly yet spry Uncle Arthur. I have a feeling that Vicki Delany may be planning a grand entrance for the man. Setting, characters, humor, red herrings... Delany's Sherlock Holmes Bookshop series is firing on all cylinders, and I'm looking forward to the next book! I like Delany's writing a lot, Cathy. And I respect the fact that she's written three very different sorts of series. That, to me, shows talent. It certainly does. Like it says on her website, she's a one-woman crime wave. I enjoy her writing very much. Good for Vicki Delany for writing another series. This sounds interesting. When is its time period? And poor Moriarty (a great name for a cat); wonder why he likes everyone but Gemma. Whose cat is he? Maybe he knows something someone else doesn't. Ornery cats aren't bad guys, just need a lot of understanding. Lived across the hall from one for 20 years. He needed affection, too. When you're allergic to cats, as I am, you tend to have a different view of the creatures. The series is set in the present day.